InvisibleHand is a great new tool for online shopping. In a nutshell, it ensures that you get the best possible price for your chosen item. I have been testing it out for the past few days, and I’m pleased with the results. Two caveats: firstly, it is an add-on for use with Mozilla Firefox. Roughly a third of Miss Thrifty’s visitors use Firefox, so I thought this tool worth mentioning. If you are using Internet Explorer, Safari or Chrome, my apologies. [UPDATE: now available for all browsers.] Secondly, InvisibleHand is currently enabled for use in three countries: UK, USA and Germany. This is how it works. 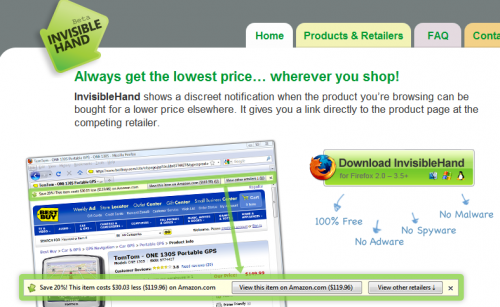 You go here and install The Invisible Hand on your browser. It is free. Next time you are searching online for a specific product – a Flip Ultra HD camera, say, or a packet of soap nuts – InvisibleHand springs into action. It searches online stores and a small text box pops up at the top of the screen to show you the lowest price and the vendor. You can then click through to purchase the item. In my opinion it is better than Google’s own shopping results, because it searches in real-time (i.e. you get the latest prices) and your results aren’t clogged up by overseas vendors who charge peanuts for the product – but the earth for shipping. I like it. Thanks for this post – I installed it and ran a few tests this evening, and I think it’s going to be invaluable!